For amazing holiday memories. Give the gift of artistically designed chocolate. An affordable luxury with taste that's priceless. You don't have to overspend during the holidays. Simply give DeBrand custom chocolates. 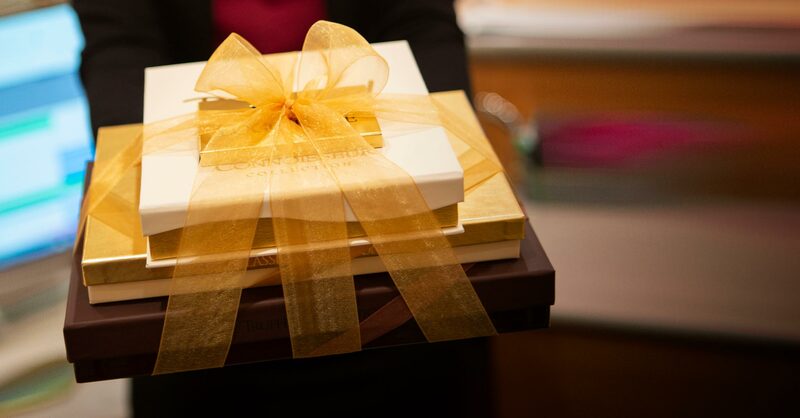 It's the luxurious gift that will be savored by the people on your list. And talked about by everyone else. For your uniquely individual recipients. Each box we create is as distinctive as the people who receive them. Select from a palette of custom chocolates that will provide the taste sensations you know they'll love. And each gift you give will be a timeless experience they'll treasure. There are many ways to put your creative touch on a holiday gift from DeBrand. Have your logo or custom graphic stamped on the packaging. Send chocolate designed to hold your business card, gift card or personalized note. Our expert staff will help you send a gift that creates excitement throughout the season. Taste for yourself and then create your custom order at a DeBrand location in Fort Wayne or Indianapolis. Explore our website and order from the wide array of artistically designed, sumptuous treats you discover. Or, call and speak with one of our expert chocolatiers. Whichever you choose, your order will get the individual attention it deserves. Can we tempt you with a few of our favorites? Join our mailing list to receive the latest news and updates from DeBrand. There were problems submitting your email address for our mailing list.